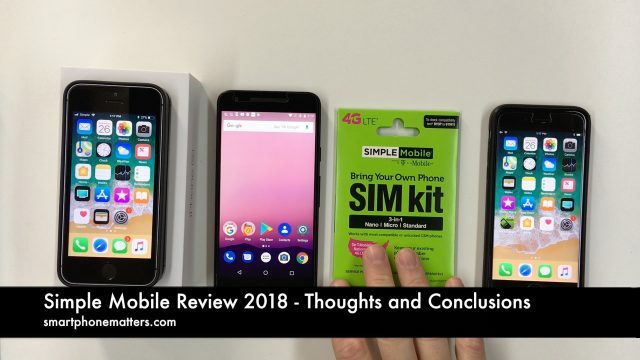 I signed up for Simple Mobile in June 2018 to review their prepaid wireless service. I published several videos about my experience. Its now almost October 2018, and I realized I still needed to write this review to share my thoughts and conclusions about Simple Mobile. For this review I’ll state right up front and say I liked Simple Mobile and I would recommend the service. I seriously considered switching both my phone and my wife’s phone to Simple Mobile. Overall, I liked the plan prices and network features and they had a plan that meets our needs. As always, you need to determine if Simple Mobile is right for you. Read on and I’ll discuss what you need to know. Simple Mobile is a prepaid wireless service. Like most prepaid wireless services, they do not have their own cellular network, instead they operate using T-Mobile’s network or towers. If the T-Mobile network has coverage in the places you use your phone, Simple Mobile could be a good choice for you. Simple Mobile is a Tracfone brand. Tracfone is a leader in the prepaid wireless business. Tracfone also owns a number of other prepaid wireless brands including Straight Talk, Net10, Total Wireless, Family Mobile, and several other lesser known brands. For my review, I signed up for Simple Mobile’s $25 plan. This plan includes unlimited talk and text plus 1GB of 4G LTE high speed data. After you use up your plan’s high speed data, you’ll still have data but at significantly reduced speeds that the company refers to as 2G speeds. The plan also included international calling and texting as well as international roaming primarily in Mexico and South America. I would have liked to see Canada on the list as well. Simple Mobile also offers a $5 discount on the $25 plan if you sign up for their Auto-Reup program. Auto Reup is an automatic payment program. You let Simple Mobile automatically charge your credit card each month and they the price of your plan drops $5 to $20. That’s a 20% discount which is significant. Their other plans have a $2, $3, or $5 Auto Reup discount put since they are more expensive the percentage discount is much smaller. And even better, Simple Mobile has a special promotion where between 3/12/2018 and 9/30/2018 (extended until 12/31/2018) you’ll receive 3GB of high speed data instead of 1GB for the life of your plan. That’s right. You’ll keep the 3GB for as long as you keep your account active, and don’t change your phone number. Simple MOBILE offers several other plans including unlimited plans. Rather than describe those all here. See article on the latest Simple Mobile Plans and Features which I try to keep up to date with the latest plans and features. When you sign up for Simple Mobile you’ll have the choice to Bring Your Own Phone or buy one from directly from Simple Mobile. If you read my articles and watch my videos, you know I am a big fan of Bring Your Own Phone. You can bring your own phone as long as it is compatible with the T-Mobile network. If your phone is from T-Mobile, it will work with Simple Mobile. If you phone is from another carrier it will need to be both unlocked and compatible with the T-Mobile network. iPhones sold since the iPhone 5 are compatible with the T-Mobile network and since the iOS software on the phones comes from Apple it is compatible with Simple Mobile. If your Android phone isn’t from T-Mobile, it may be compatible with the T-Mobile network, but the Android software on the phone is from the carrier that sold the phone and you might find that not all features of Simple Mobile work properly. I signed up online at simplemobile.com. I opted to get a new phone number but you’ll also have the option to transfer your current or existing phone number to Simple Mobile. The signup process was quick and I didn’t have any issues. If you decide to transfer your number you’ll need some additional information from your current carrier and the transfer could take up to 48 hours. Whenever I review a prepaid wireless service, I check that the basic plan features are functioning properly. With Simple Mobile everything worked well. I was able to make and receive phone calls on both the my iPhone 6s and Google Nexus 5x. I tried calling several home and mobile phone numbers. The calls were clear. I had no dropped calls and no problems connecting. I was also able to send and receive text messages on my my iPhone 6s and Google Nexus 5x without issue. I also was able to both send and receive MMS picture messages and group texts on the y iPhone 6s and Google Nexus 5x. When you try this on your iPhone 6s you need to make sure you try picture messages and group texts with someone that doesn’t use an iPhone. You want to check that MMS is working and not just Apple’s iMessage. Both the iPhone 6s and Google Nexus 5x were able to use Visual Voicemail. This was great because Tracfone branded services usually only provide regular voicemail. Finally, I was able to use cellular data to connect to the Internet with both the iPhone 6s and Google Nexus 5x. If you use up your fixed amount of high speed data, you can buy more. Simple Mobile had add-on data. You can add 500Mb for $5 or 1.5GB for 1.5 GB. I’ll discuss cellular data more later. I also checked to see if I could see could use a number of advanced 4G LTE features with either phone. Simple Mobile had excellent support for these features. I was able to use Wi-Fi calling on my iPhone 6s, iPhone SE, and Google Nexus 5x. I had to enable Wi-Fi calling on both the phones as well as on on simplemobile.com. Simple Mobile also supported Personal Hotspot and Portable Hotspot on both the iPhone 6s, iPhone SE and Google Nexus 5x. With hotspot I was able to connect my iPad and MacBook Pro to my phone using Wi-Fi and use my Simple Mobile cellular data to access the Internet. One of the features of 4G LTE is Voice over LTE. With Voice over LTE you can make phone calls and use 4G LTE cellular data at the same time. I was able to use simultaneous voice and data on both my both the iPhone 6s and Google Nexus 5x. I was had an LTE data connection and was able to use Chrome and Safari to read the web while on a phone call. I wanted to tell you a little bit more about cellular data. I found the 4G LTE data speeds to be as fast. Even though Simple Mobile states that their customers may see reduced speeds compared to T-Mobile customers I didn’t notice unusually slow data. Based on the speed tests I preformed, there does not seem to be any maximum download speed imposed. Simple Mobile has three different free apps My Account, International Dialer, and WiFi. For this review I only tried the My Account app. I found that My Account worked well. Its a basic app but it provides the features you need to manage your account. Simple Mobile International Dialer lets you make international phone calls without having to dial Simple Mobile’s International access number. That is, it dials the number for you, so you don’t have to. Simple Mobile WiFi helps you locate and connect to free WiFi hotspots when they are available so that you can use free Wifi instead of your cellular data when possible. Check out my video about Wi-Fi calling and the Simple Mobile apps below. In conclusion, I like and recommend Simple Mobile for anyone that wants prepaid service in an area were T-Mobile has the best or is the only network with coverage. I used T-Mobile prepaid wireless service in 2012 and in my area it was horrible. in 2018 the T-Mobile network works extremely well in the Boston metro area. I did not encounter many dead spots but did not have the chance to try it in s lot of locations. I was able to use the service while travelling to the New York City metro area and it worked well there too. The $25 plan would totally meet my needs at with the auto re-up discount and current promotion a plan with 3GB of data for $20 is a great deal. I was also glad to see that Simple Mobile supports add-on data. At $5 for 500mb and $10 for 1.5GB the price is just ok. Unfortuately their add-on data does not roll over and expires at the end of the plan cycle in which you added it. Both Straight Talk and Total Wireless, two of the other Tracfone brands, roll over add on data indefinitely with active service.